THE SPAWN OF MARS by Wally Wood and various EC writers, as I mentioned last week, is heavy on twist endings; while the stories occasionally have some pathos in the twist, I’d pick DC’s Strange Adventures any day (even though the cover-first method of creation could be just as gimmicky as an ending twist). And while this tries for more technical realism, the technobabble is at least as tedious as some of what you’d get in the DC book. LAZARUS: Lift by Greg Rucka and Michael Lark has Forever Carlyle dealing with a terrorist threat against her kin and an impoverished family struggling to get on the Carlyle payroll (the Lift process referred to in the title). Unfortunately the results are inferior to the first volume: The story is just a backdrop for flashbacks to Forever’s youth and to introducing the new characters, and it’s less interesting than the scheming of the first volume. 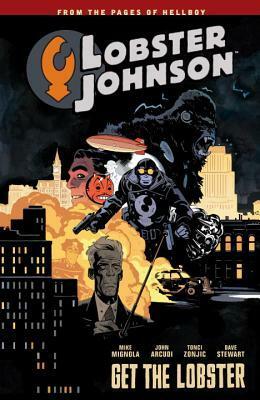 LOBSTER JOHNSON: Get the Lobster! by Mike Mignola and Tonci Zonjic (cover by Zonjic, rights with current holder) has the Lobster targeted by the cops when a battle with two mind-controlled wrestlers leaves a chaotic mess behind it. Meanwhile, reporter Cindy Tynan is digging into the Lobster’s secret origin … Pulpy fun, though the subplot involving a gangster has no payoff (I realize that’ll come in the next volume, but it still felt like an awkward fit). I’ll have this on the Hellboy Chronology later today.